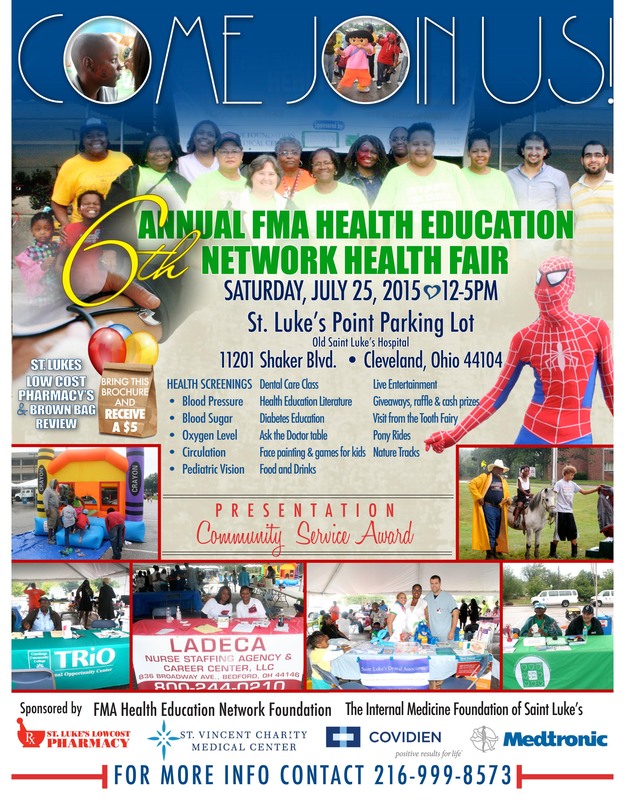 Cleveland, OH – In an effort to close the gap on disparities in health education among minorities and the under served in Cleveland, FMA Health Education Network presents its 6th Annual Health Education Network Health Fair this Saturday, July 25th from noon – 5 p.m. in the parking lot of St. Luke’s Pointe (the old St. Luke’s Hospital), 11201 Shaker Blvd. The goal of the Health Fair is to present health education information, and other vital information to the residents in the immediate vicinity of St. Luke’s Pointe. With more than 700 community members serviced last year, the Associates expect an even larger audience this year. Some of the offerings will include glucose, oxygen and circulation screening in addition to blood pressure checks and the Grand Opening of The St. Luke’s Low Cost Pharmacy featuring a “Brown Bag Review” of prescriptions for any potential medical interactions. Services and information will be provided by practices within St. Luke’s Pointe Medical Center, Faith Medical Associates and St. Luke’s Dental Clinic among others. A fair would not be complete without activities for children including the City of Cleveland Smoke House, Metro Park Nature Tracks, pony rides, face painting and entertainment provided by the City of Cleveland Department of Recreation’s Show Wagon. A brief award ceremony will include the presentation of the Service Community Award to Michelle Knight in honor of her work in the community. Event organizer Dora Appling, said the event demonstrates “Where faith and medicine work together” the people will not only survive they will thrive.